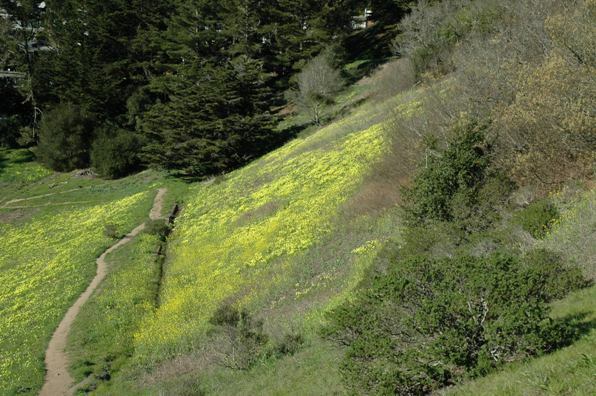 Trail work has been racing ahead in Glen Canyon. Today, we were visiting the area just below the Christopher Playground. There’s a new trail now. (Number 2 in the picture below.) 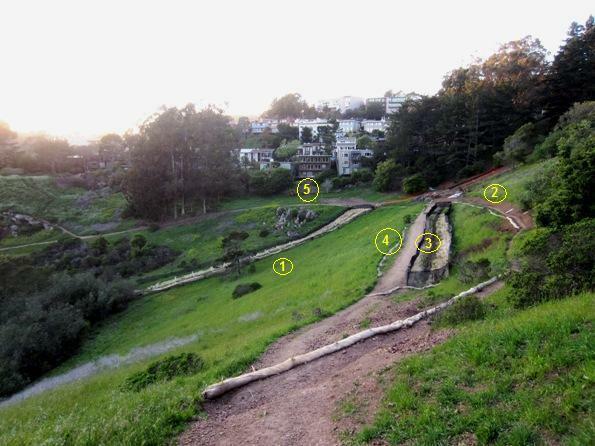 It runs above a shallow drainage channel (Number 3) and the trail that runs along it (4), which will presumably be closed since the two trails connect the same points. 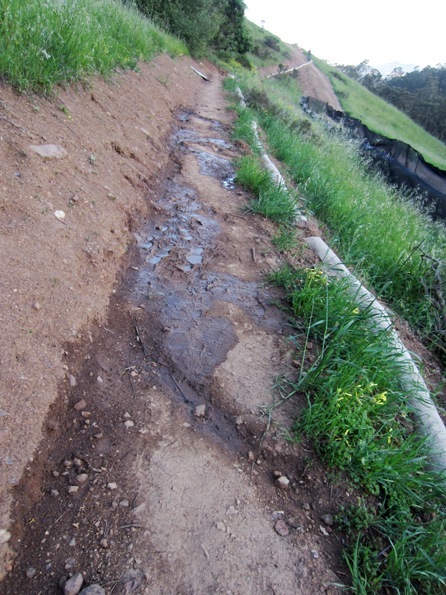 Another shallow drainage channel (1) that carried rainwater run-off into Islais Creek – and also functioned as a trail – is being closed and planted over. Except. There’s a reason that the drainage channels exist. And a reason the trail was on the downhill side of the channel. Channel 3 caught the water running off the hill and kept trail 4 dry on rainy days. The new trail has got seeps all along it, making it muddy even on a dry day like yesterday. It’s catching the same runoff, but it’s not a channel. It looks like this. 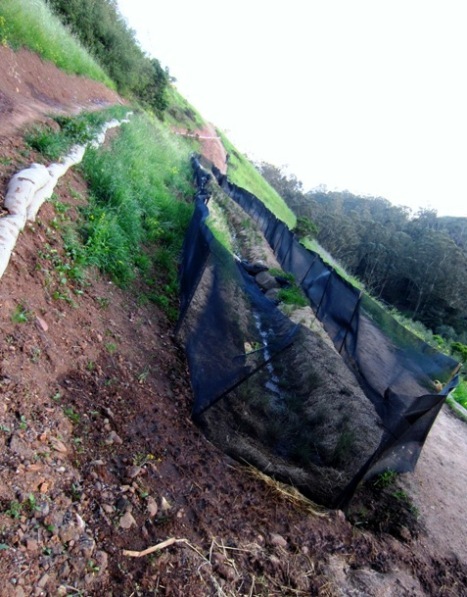 The drainage channel – shrouded in black net for some unknown reason – is full of standing water. We have no idea what it’s doing to the stability of the hillside, but luckily there are no homes in that vicinity. We hope the blocking of the drainage channel (1) isn’t having a negative impact, but we won’t know until a year of heavy winter rains. Where will the water go then? Wherever it wants. Here’s what the drainage channel and path looked like three years ago, in February 2011. We can’t see what was objectionable about it and required a new trail that essentially connected the same points. Here’s what the whole scene looked like in February 2011. There’s been another change, too; some trees that screened the homes next to the Canyon have been removed (5), giving it a more urban feeling (and probably improving the views for the homes there). What’s next? 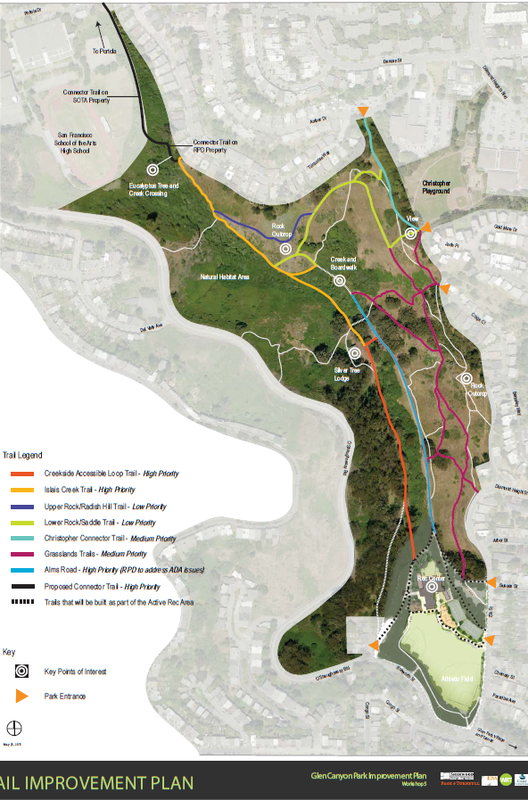 Here’s the plan for all the trail work in Glen Canyon. 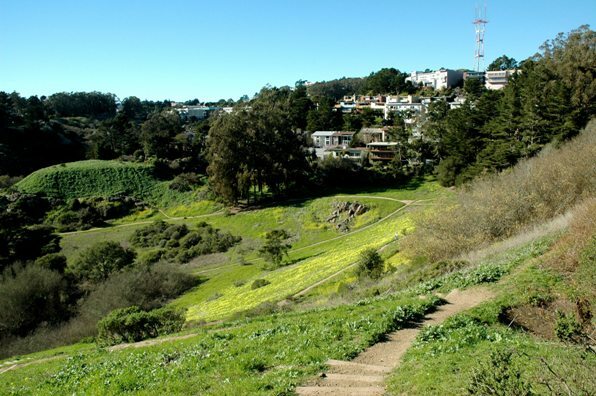 This entry was posted in General and tagged environment, Glen Canyon Park, Trails. Bookmark the permalink.